A funny and entertaining history of printed books as told through absurd moments in the lives of authors and printers, collected by television’s favorite rare-book expert from HISTORY’s hit series Pawn Stars. Take, for example, the Gutenberg Bible. While the book is regarded as the first printed work in the Western world, Gutenberg’s name doesn’t appear anywhere on it. Today, Johannes Gutenberg is recognized as the father of Western printing. But for the first few hundred years after the invention of the printing press, no one knew who printed the first book. This long-standing mystery took researchers down a labyrinth of ancient archives and libraries, and unearthed surprising details, such as the fact that Gutenberg’s financier sued him, repossessed his printing equipment, and started his own printing business afterward. Eventually the first printed book was tracked to the library of Cardinal Mazarin in France, and Gutenberg’s forty-two-line Bible was finally credited to him, thus ensuring Gutenberg’s name would be remembered by middle-school students worldwide. 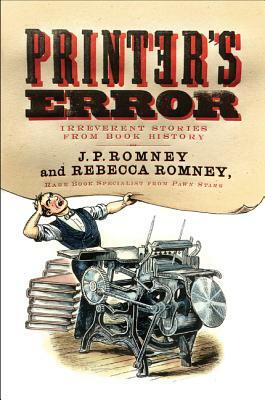 Like the works of Sarah Vowell, John Hodgman, and Ken Jennings, Printer’s Error is a rollicking ride through the annals of time and the printed word. Rebecca Romney’s appearances on the History Channel’s Pawn Stars have made her the country’s most recognizable rare book dealer. In her career, she has sold single volumes for $500,000, books from the libraries of Isaac Newton and Queen Elizabeth I, and more than one Shakespeare Folio. J. P. Romney is a historical researcher and the author of the young adult novel The Monster on the Road Is Me. Written in an engaging, accessible style, these accounts will appeal to fans of Pawn Stars, as well as scholars of literature and printing history.